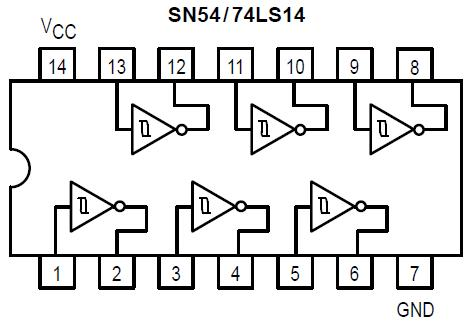 The 7414 IC is composed of six independent Schmitt-Triggered single-Input INVERTER gates. The general logical performance of these INVERTER gates resembles that of the 7402 or other typical INVERTERs.The addition of the Schmitt Triggered circuitry affects the wave forms that are produced as an output. Schmitt Trigger Circuits are generally constructed from a comparator, but instead of the usual negative feedback, they implement a positive feedback mechanism. In the most simplest terms, Schmitt Trigger logic gates have a greater immunity to noise in the input lines. With noise suppression, the logic gates (in this case INVERTERs) are more likely to remain in their current state unless a true change to the input was intended. Glitches and high speed random noise in the line is less likely to toggle the status of the output.